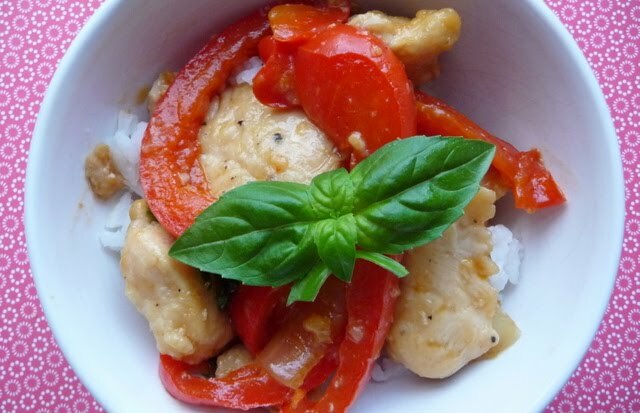 I went on a search for some fresh Thai basil for this recipe– but it was no where to be found anywhere I looked – and I even went to an oriental food store :( Regardless, I was able to use regular basil and this was a delicious, easy weeknight meal. If I ever do find Thai basil – I will definitely try this recipe again. 1. Pat chicken pieces dry with paper towels. In a medium bowl, toss chicken with cornstarch until coated; season generously with salt and pepper. 2. In a large nonstick skillet, heat 2 teaspoons oil over medium-high. Cook half the chicken, turning once, until browned, but not completely cooked through, 2 to 3 minutes total. Transfer to a plate. Repeat with another 2 teaspoons oil and remaining chicken. Transfer chicken to plate. Set aside. Wipe out skillet with a paper towel. 3. To skillet, add remaining 2 teaspoons oil, onion, and bell peppers; cook over medium-high heat, tossing often, until beginning to brown, 3 minutes. 4. Add garlic; cook until fragrant, about 1 minute. 5. Add 1/4 cup water, vinegar, soy sauce, and chicken to pan; cook, tossing, until chicken is cooked through, about 1 minute. Remove from heat. 6. Stir in basil leaves. Serve immediately, over white rice.